11 April 1982: a smell is coming down John Golding Road right alongside the boy-child, something attached to him, like a spirit but not quite. Ma Taffy is growing worried. She knows that something is going to happen. Something terrible is going to pour out into the world. But if she can hold it off for just a little bit longer, she will. So she asks a question that surprises herself even as she asks it, "Kaia, I ever tell you bout the flying preacherman?" Set in the backlands of Jamaica, Augustown is a magical and haunting novel of one woman’s struggle to rise above the brutal vicissitudes of history, race, class, collective memory, violence, and myth. KEI MILLER is the author of two previous novels, several poetry collections, and Fear of Stones and Other Stories, which was short-listed for the Commonwealth Writer's Prize for Best First Book. In 2014, he won the Forward Prize for Best Poetry Collection for The Cartographer Tries to Map a Way to Zion. Born in Jamaica, he lives in London and teaches creative writing at Royal Holloway, University of London. "The richness and heft that is lost in the making of official accounts of the world is one of Miller’s favorite themes... Where the poet’s touch in “Augustown” becomes detectable is in the novel’s epigrammatic concision and in the loping, conversational cadence of so many of its sentences... The barely perceptible Caribbean lilt in Miller’s prose exerts a hypnotic effect that is one of the great pleasures of Augustown...An expansive talent, of a writer stretching to catch up with his own curiosity and fertility...The center of the novel, Miller’s portrait of Augustown, holds." "Brilliant... Moving... Each observant sentence in this gorgeous book is a gem." "The structure of “Augustown’’ is pleasingly loose — a regular feature of novels written by poets, who seem to enjoy sauntering about once they’ve escaped the house of poetry... Miller’s poetry provides memorable line after line...If anything maps the way to Zion, Miller suggests, it’s this continued witness to untold history, this attention to how the glimmer of the future might be seen in the past." "A deeply interesting historical novel, not least because it covers matters little-known beyond Jamaica...Kei Miller’s considerable skills show vividly in his control of this back-and-forth narration...He is equally adept at characterization. Kaia is a lovely portrait of a little boy, and Ma Taffy is only the most important and lively of the people who seem to jump from his pages. Not least of the means used to power them is their Jamaican speech, sparkling with adjective and metaphor, inventive in syntax, studded with old words from England and Africa. Readers can almost see Kei Miller having fun writing this dialogue. Indeed, Augustown feels like a novel that its author enjoyed writing. It’s certainly a serious pleasure to read." 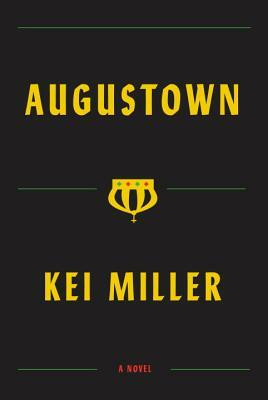 "Miller’s novel exhales the breathy immediacy of the here and now...Augustown offers a compelling variation on the theme that black lives matter... As with Marlon James’ A Brief History of Seven Killings, it demands [to] be heard." "Augustown is a gorgeously plotted, sharply convincing, achingly urgent novel deserving widespread attention." "Miller captures the ways community, faith, and class create a variety of cultural microclimates." "Miller's new novel uses assured poetic language to create important historical intersections and strong, realistic characters... Highly recommended, and not just for lvoers of African and Caribbean folklore. This book will appeal to a wide range of readers interested in fiction that's grounded in community."